As I prepare to begin my 20th year with Women Under Sail, I will be celebrating not only this accomplishment, but also how very lucky I have been, and still am. I have worked with hundreds of fantastic women, taken some life changing and challenging voyages with students and my family, and have made some wonderful lasting friendships. Sail with Jane and I this summer, and help us celebrate 20 Years of teaching women our love of sailing and the sea. Have you ever been driving along the Eastern Prom, or coastal Maine and gazed at the bright white sails dancing across the water? Have you said to yourself? “That is so beautiful, I want to do that, I want to be there, I want to learn to sail” That’s what happened to me. For me it was in another part of the world, and in a former life. What I brought with me into my new life in Maine was a 21ft sailboat, and a passion for sailing. I was taught how to sail on Lake Superior, by a man whom I now call my mentor. He was patient, gentle, and taught me well. I was infused with his passion and vast knowledge of sailing. I came to Maine as a traveling nurse in 1982. I visited Camden and Bar Harbor, and was hooked. I remain stunned by the beauty of our coast, and of its people, of which I am now one. 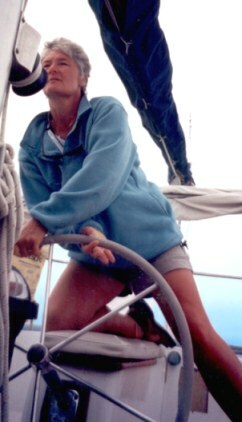 Thirty three years later I am Captain Sharon Renk-Greenlaw, in my 20th year as owner and instructor of Women Under sail, a 3 day live aboard sailing school for women on Casco Bay Maine. Captain Sharon Renk-Greenlaw has been sailing the coast of Maine and beyond for 35+ years. Licensed by the US Coast Guard with a Masters 100 ton ticket, Sharon’s knowledge of the sea, it’s circumstances, and the instruments of its navigation are well weathered. With an emphasis on safety and teamwork, Sharon and First Mate Jane Parker invite you, regardless of your skill level, to join the hundreds of other women who have discovered their abilities and love of sailing with Women Under Sail. Raised in Northern Michigan, Sharon began to sail on the volatile waters of Lake Superior. Sailing in Maine since the early 1980’s she has cruised the entire East Coast as far south as Venezuela, the Caribbean, and Bahamas. Maine’s spectacular rocky coast, and variable weather patterns, present a very rich and challenging opportunity for learning the technical skills and the art of sailing. A solid foundation in team sports, and group dynamics, has equipped Sharon with a teamwork philosophy, and sailing provides the medium to promote these skills. Sharon lives with her husband Larry, in their home overlooking the Haraseeket River, just a few hundred yards from AVATRICE. When not sailing, Captain Sharon is working as a nurse, or persuing her new passion as a watercolor artist.